WHY GO: Rock hounds already know about Sussex County NJ. 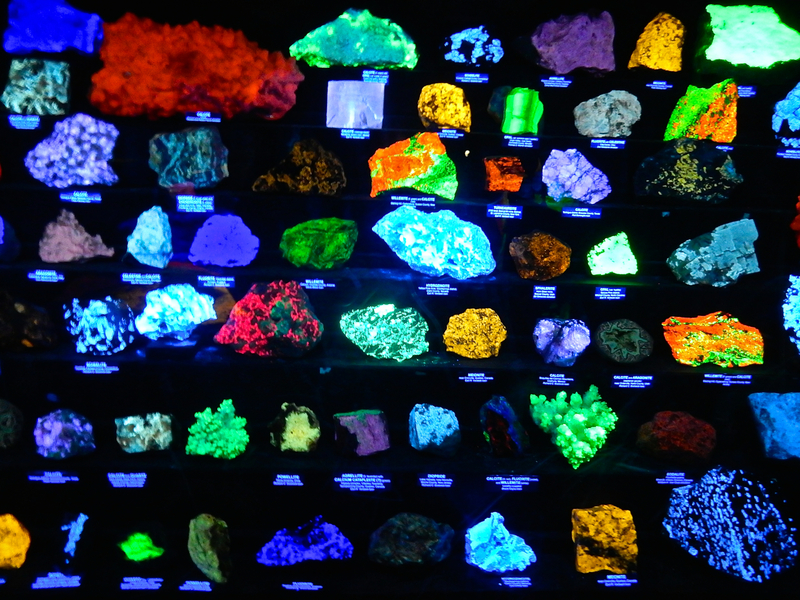 New Jersey’s Northwest region claims the largest concentration of fluorescent rocks and minerals in the world. You can see a critical mass of these glowing objects at a decommissioned zinc mine, which is now an indescribably awesome museum complex, try some hooch at Sussex County’s first distillery, tour one of the most prestigious wine cellars in the country, golf, ski, zipline, or do nothing to your hearts content on this World of Wonders NJ Getaway. 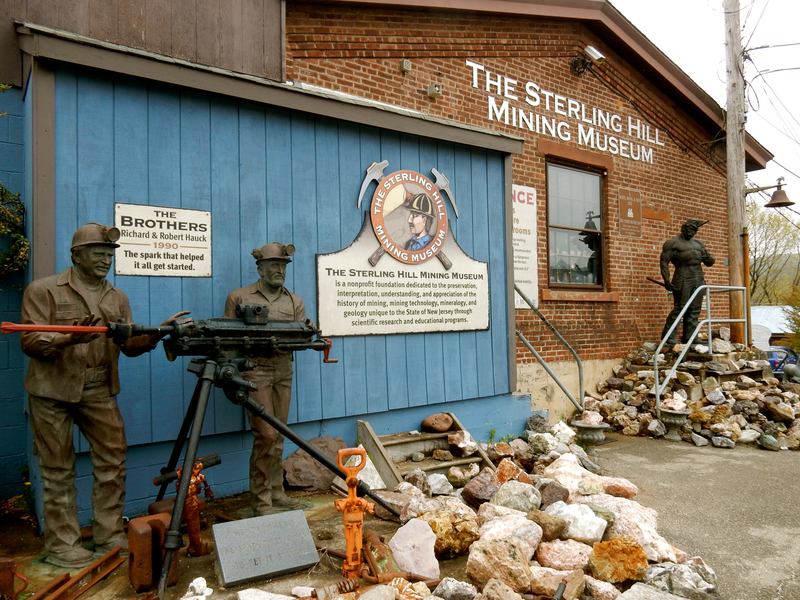 TOUR: Sterling Hill Mining Museum, Ogdensberg. How extraordinary is this under-the-radar attraction? 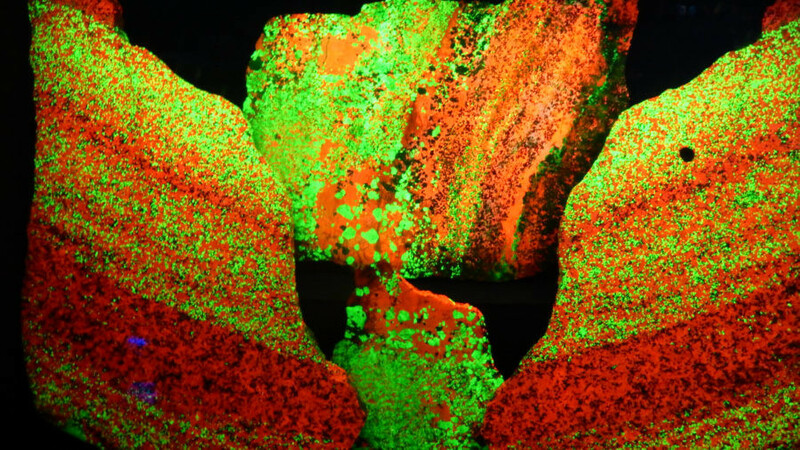 So extraordinary that the venerable Museum of Natural History in NYC is interested in featuring its defining element – a thick slab fluorescing rock – in a stand alone room within an upcoming $325 million expansion. 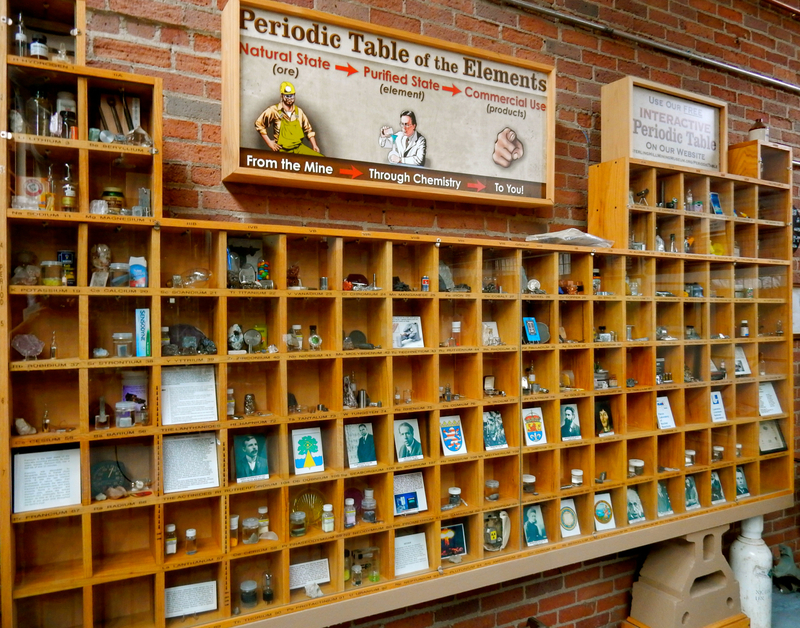 A zinc mine from the 1700’s to 1986, Sterling Hill is now being run as an Educational Foundation, with 40,000 students from elementary school to college age discovering the unique properties of minerals here. Civil Engineer/Adjunct Professor of Engineering Geology, Bill Kroth, serves as President, Executive Director and sometime-guide. During its WWII heyday, when 500 employees put their backs into it here, the Sterling Hill complex seemed more like a railroad yard than a mine. “You’ll never see a piece of zinc,” says Kroth. “It doesn’t occur as pure metal.” A 5-story crushing plant was perched at the top of the hill, smashing zinc ore to powder. The powder traveled by conveyor belt, dropped into four massive drums (all still standing), and was emptied into train cars below. The raw product was shipped to Pennsylvania, where it was processed into the metal we recognize as zinc. Historically, zinc was added to copper to fashion brass and for galvanizing iron and steel to prevent rust. The Sterling Hill mine, 2,700 ft deep (two Empire State Buildings) was threaded with 35 miles of tunnels. In the early 1900’s, the miners learned about the unique property of these rocks quite by accident. At the dawn of the electric light, they used a “knife-blade” switch, which caused a spark. This spark illuminated the walls, which glowed a ghostly green. 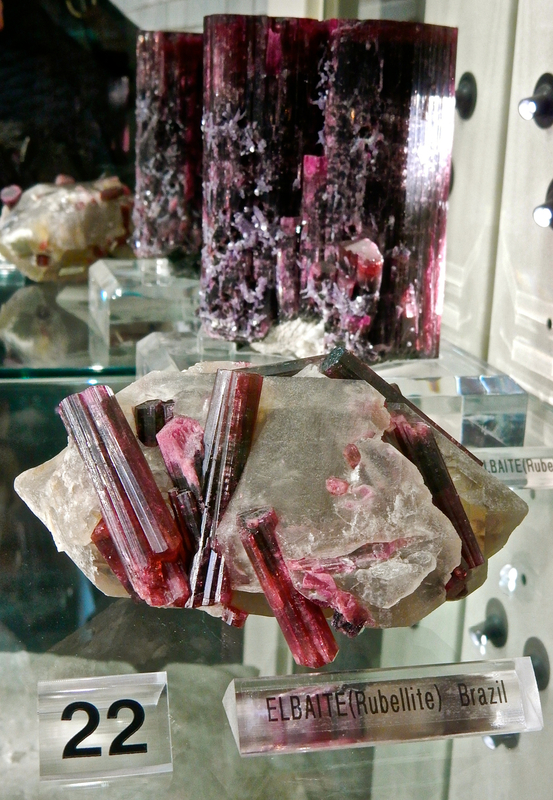 Over the years, nearly 370 minerals were discovered here, 80 of which fluoresce; rendering this area unique in the world (thus the interest from the Museum of Natural History). 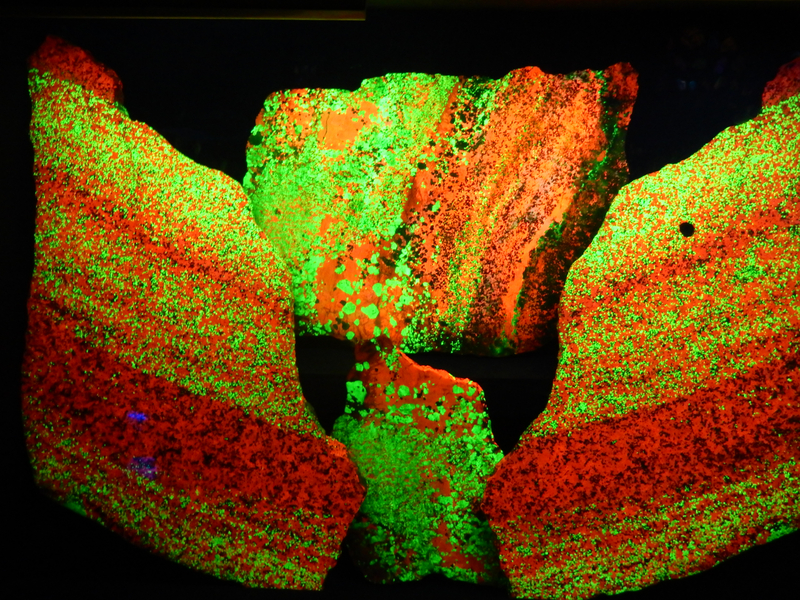 You’ll see all manner of fluorescing wonders inside the 3-room Thomas S. Warren Museum of Fluorescence –where pure light seems to emanate from within each rock. If you’ve been awed by stones bathed in Black or UV Light, you’ll be even more so by those illuminated by the Short Wave light employed here. There is a significant difference. 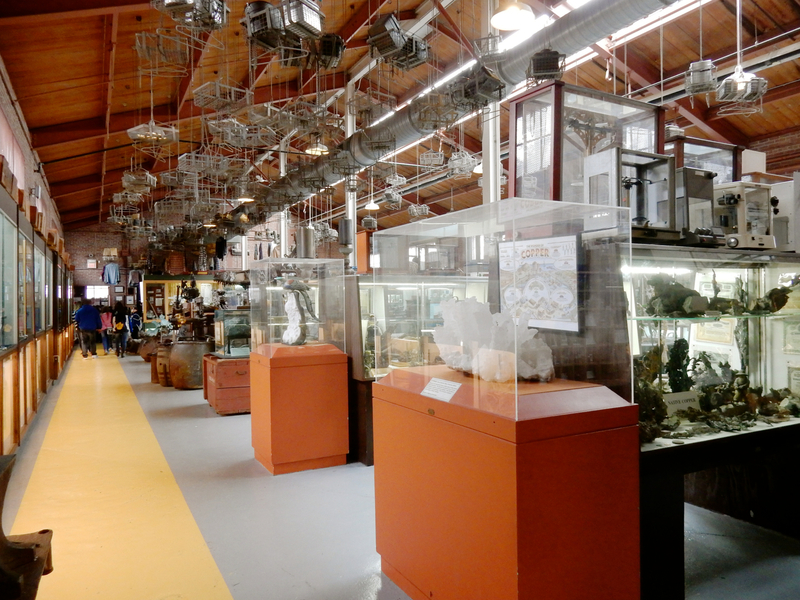 The Mine’s main museum space, the Zobel Exhibit Hall in the former “Dry House” (where wet clothes would be lifted to the ceiling to dry), is crammed with extraordinary objects, collections and artifacts. You’ll find one of the world’s best Periodic Tables (an incredible Science Fair resource, especially since the website offers a free interactive version), the stunning Oreck Collection of blingy, multicolored minerals and crystals from around the world, and a piece of the meteor that fell on a car in Peekskill NY on October 9, 1992. 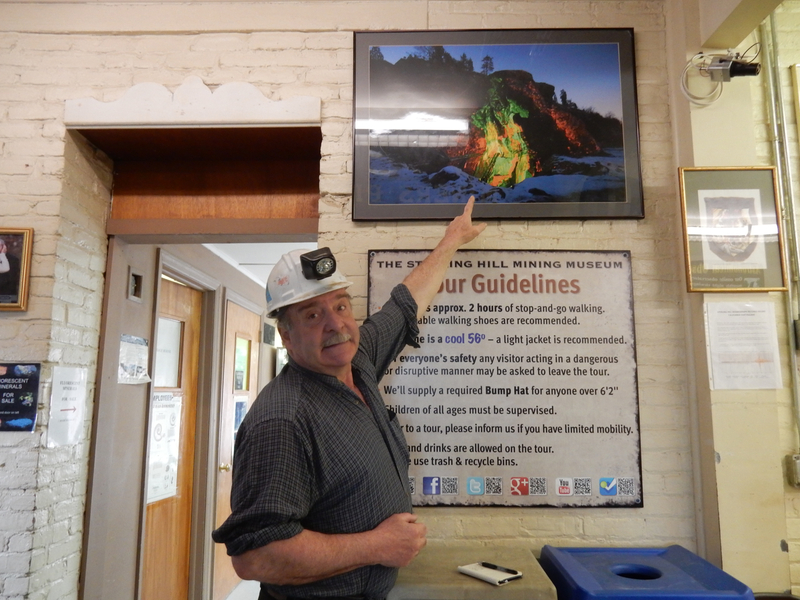 And yes, a tour will bring you into a portion of the mine, where you’ll learn about blasting and tough conditions. However, that foray seems a bit anticlimactic after gazing on what came out of it years ago. This attraction is well worth an afternoon – and should be a destination for all. Open daily 10-4 (in winter, weekends only), with public 2 to 3 hour tours at 1pm, $12 adults, $9 kids. 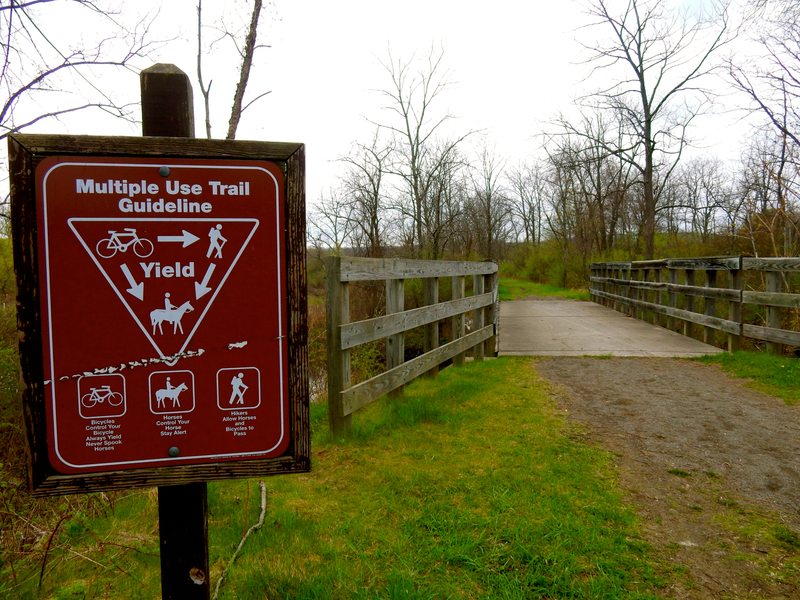 HIKE/EXPLORE: Kittatinny Valley State Park, Andover Township. This breath of-fresh-air park has 75 miles of trails and intriguing programs to get you out on them – no matter what level of couch potato you are. There are “nature tours,” obviously, and other “interpretive programs.” But it’s activities like “Hike To Happy Hour” – 3 miles with Beer and Pizza at the end, just $5, the 4 mile “Walk to the Winery,” $5, “Bike To BBQ: Double S Smokehouse,” and the like that will really get your juices flowing. These are novel (and very popular) ways to get people active, connected, and fed. A win-win-win all around. Visitors Center open daily 9-4. 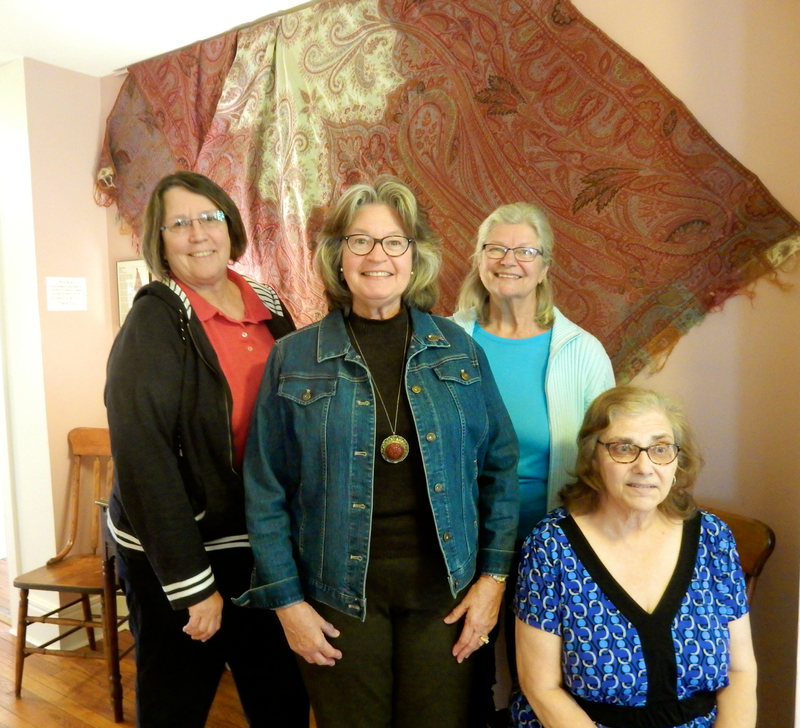 VISIT: Sparta Historical Society Museum at the Van Kirk Homestead, Sparta. This is no stale and stuffy museum: it’s a vital, enjoyable, beautifully presented and relevant collection of local history, thanks to zingy women like Nancy Madacsi, Joyce Simmons, Renee Ferguson and Maryanne Francisco, who bring life and intelligence to this small place. Built in the late 1700’s, the Van Kirk family lived in this two-story homestead until 1996 when most of the property was sold to the Sparta Board of Education to construct the behemoth Middle School right next door. The Historical Society was able to save and restore the Van Kirk house, with a 365-year- old White Oak Tree – the second oldest in the state – shading its roof. The Sparta Historical Society Museum has benefited from a curator’s eye – and that curator is Museum Director Jack Clark, who was formerly the Director of the Bruce Museum in my own hometown of Greenwich CT (the one that I spent days upon days in as a kid in the 60’s and 70’s). That this small organization was able to tap the expertise of such a stalwart of the Museum community speaks to the quality of its exhibits and enthusiasm of its members. There’s a well-preserved Stereopticon in the downstairs Victorian Era Parlor with, as the ladies told me, “some pretty risqué pictures.” I would have looked at the dozens of “3-D” photographs, noted the naughty ones, and “toured the world” as they did in the 1890’s, if I’d had the time. (P.S. – make time to do this). Upstairs, in the Sparta Gallery, some of the documents and photos depicting the history of the town are mounted on black slate from an old church. Though the area around Sparta was best known for its mines, quarries and taverns, by the mid 1900’s tourism was on the rise. Resorts sprung up along Sussex County’s many lakes, including Lake Mohawk, which sported a boardwalk that is still there (though the resorts closed). I was quite taken with several items on the second floor. I loved the ingenious fully mobile bookshelf/desk used by itinerant teachers who traveled throughout the county. 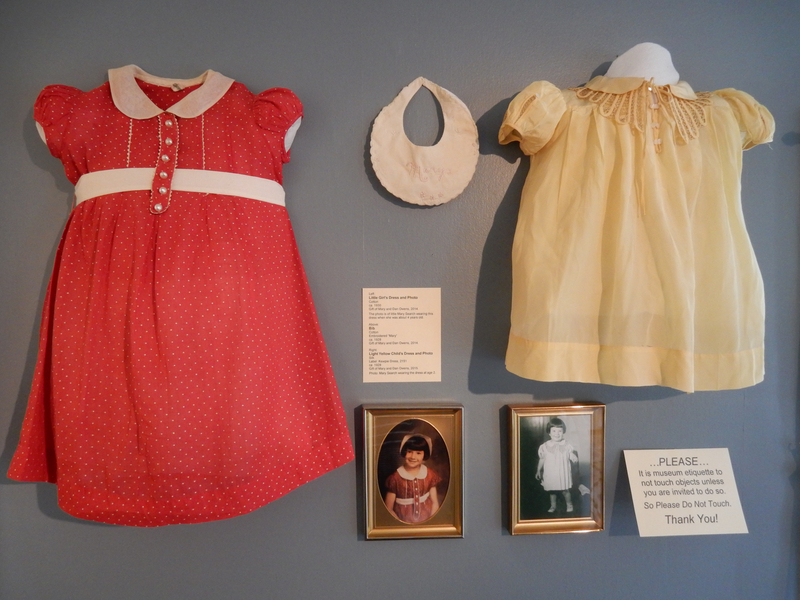 I could not comprehend how the little polka dotted red dress, mounted in the Children’s room and worn by Mary Owen in 1930 (shown in photo below it) was so well preserved. 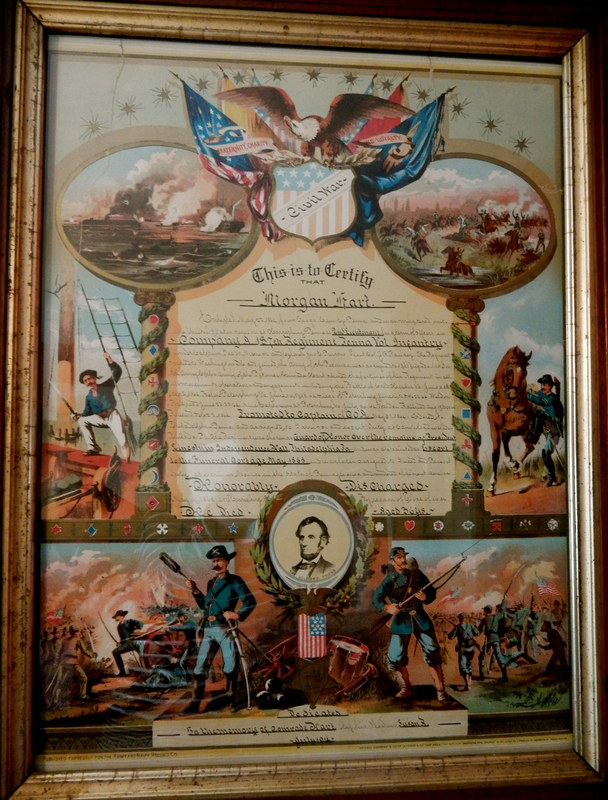 And I was most intrigued by an original Honorable Discharge Certificate for one Morgan Hart, who must have served exceptionally during the Civil War, as he was asked to accompany the body of President Abraham Lincoln on Lincoln’s Funeral Train. After Hart’s death, this decorative document was presented to his widow, and remains in beautiful shape. Open only the 2nd and 4th Sunday of every month from 1-4 or by appointment. TASTE/SHOP: Milk Street Distillery, Branchville. 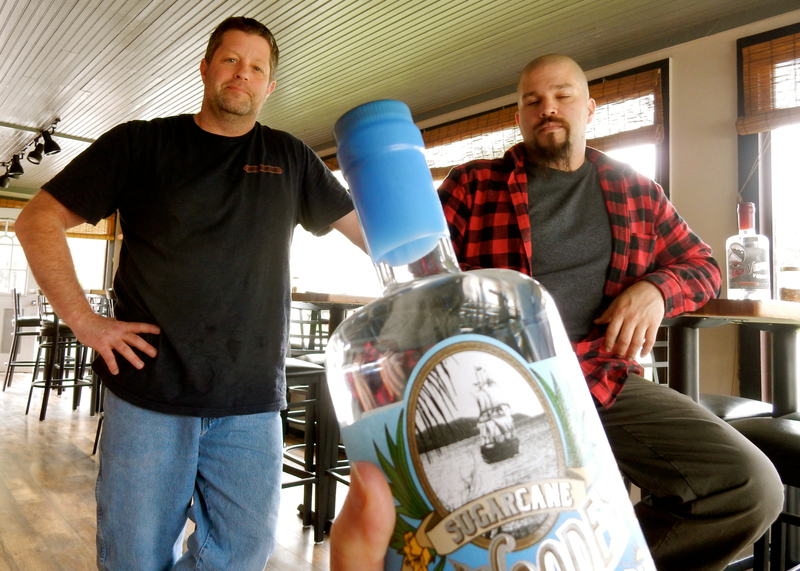 Milk Street Distillery owners, Gordon and Mike Geerhart, were “in construction” before opening this labor of love in this blink and you’ll miss it town. Their skills were obviously put to good use. The tasting room, carved from the shell of a 125-year-old building, with burnished hard wood floors and reclaimed-red-barn-wood-bar topped with a lacquered slice of tree trunk, is striking. 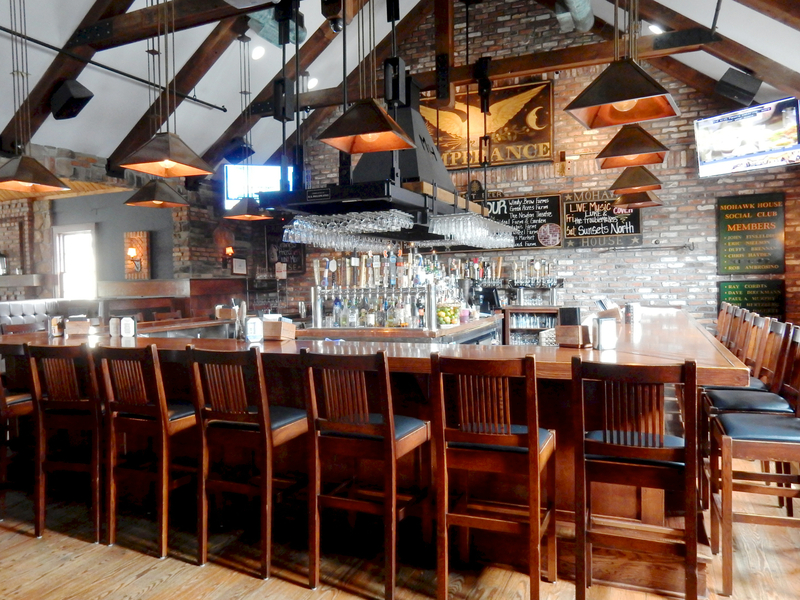 As pretty as the tasting room is, the cocktails – just $8 each – are even better, showcasing the house-made Black Vulture Vodka and Wooden Leg Rum to perfection. $8 for tour, 3 ½ oz tastings and shotglass. Open Fri. 4-8, Sat 1-7, Sun 1-6. Though no food is served, you can bring your own, and the local pizzeria delivers. WALK: Lake Mohawk, Sparta. Promenade along the boardwalk that traverses Lake Mohawk. The whole town has the appearance of a Swiss Village – and this was by design. 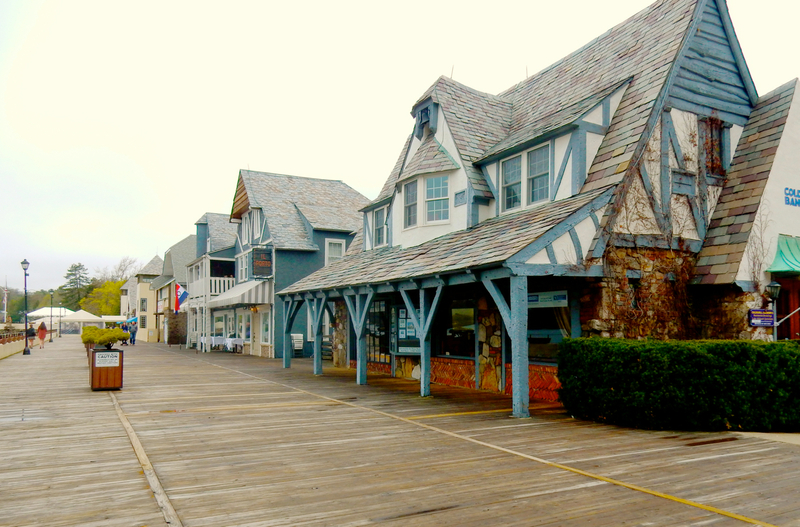 You’ll feel as if you’ve stumbled into a European Alpine lake town. EAT: Mohawk House, Sparta. I’m still trying to decide where to fit this 350-seat restaurant, built from hyper local resources. Should it be listed in “Where to Eat,” or “Things To Do?” Because it’s worth seeing even if you just pop in for a look. Steve Scro and his wife, Rachael, had a vision, which in 2005 culminated in this Adirondack-style structure (that should not be confused with Mohonk Mountain House in New York), built out of Patterson NJ brick, fieldstone from surrounding land, reclaimed weathered wood floors from a nearby mill, and filled with furniture made by local artisans: touches of Sussex County in each room. “We built with our hearts,” admits Scro. The Scro’s also own a big Sussex County farm, and procure ingredients and goods from forty other nearby producers and artisans – from farms, ranches, breweries, and woodworkers. Their famous 10-Mile Burger (all ingredients sourced within ten miles) was featured on the Food Network. Water Buffalo meat and cheese comes from Green Acres Wantage, turkeys from Waterwheel Farm (Mohawk House does a major Thanksgiving business), and other purveyors arrive each day in pickup trucks laden with fresh wares. 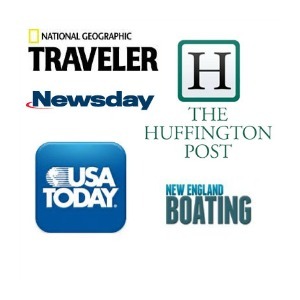 Scro is known for establishing first contact with local purveyors, in fact. He reached out to the Geerhart Brothers at the brand new Milk St. Distillery before they even had a chance to call him, much to their amazement. EAT: Krogh’s Brew Pub, Sparta. Across from the Lake Mohawk promenade, what is now Krogh’s was built in 1927 as a Trading Post (and is on the National Historic Register). 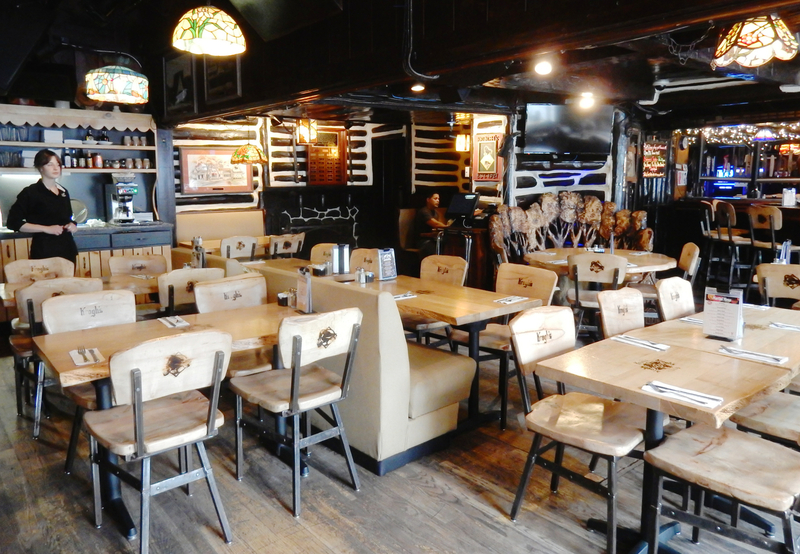 The Fuch’s family purchased the Bavarian/Swiss-style restaurant 36 years ago, hiring chainsaw carver, Brett McLain to design dramatic wooden doors and interior chairs as heavy as iron, giving the room a sort of Viking appeal. 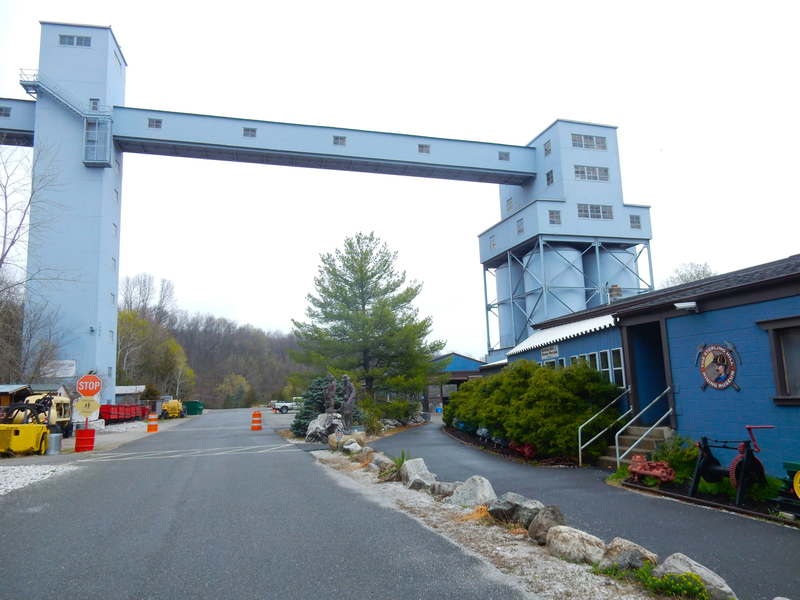 Krogh’s added an on-site brewery in 1998 – the first Brew Pub in Sussex County. Now, it’s a landmark and people come from all over the world to wander the Germanic-looking village, stepping inside for a fantastic burger, hot Panini, a pint or flight of excellent brews (the most popular – Red Ale) and perhaps a growler. 7-Flagship Sampler (2 pints total), $13. EAT: Krave Cafe, Newton. Locals rave about Krave. You’ll find this little gem in a strip shopping center next door to a Quick Check. Food is as fresh as could be, very good, and reasonable priced. 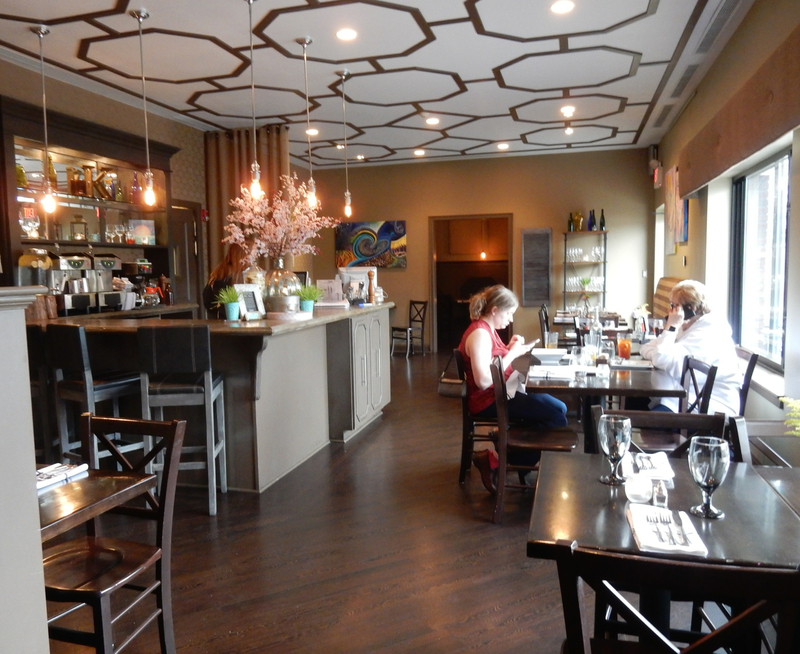 Try the Black Bean Quinoa Burger ($11), Beef Short Ribs ($20), Chicken Cassoulet ($16) or any special offered. 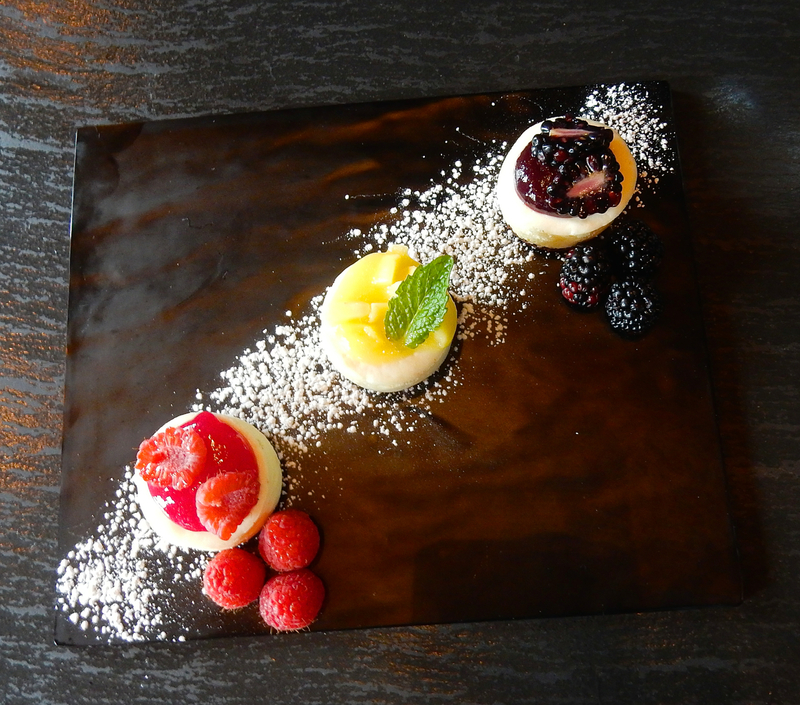 This cool and stylish spot is a local favorite for a reason . EAT: The Chatterbox Drive In, Augusta. Built in 1997 to look like a circular 50’s diner, this be-bop stop on busy Route 206, right across from the Sussex County Miners baseball field, packs ‘em in, especially on “motorcycle nights.” Of course, burgers, shakes and fries reign on the menu, but the Chatterbox is also known for its homemade soups, great salads, and the signature “Big Bad John” sandwich – pulled pork, mac & cheese, and sautéed onions on sourdough – featured on the Cooking Channel’s Junk Food Flip. This place is so “Happy Days” iconic, Henry Winkler, aka “The Fonz,” has been here twice. 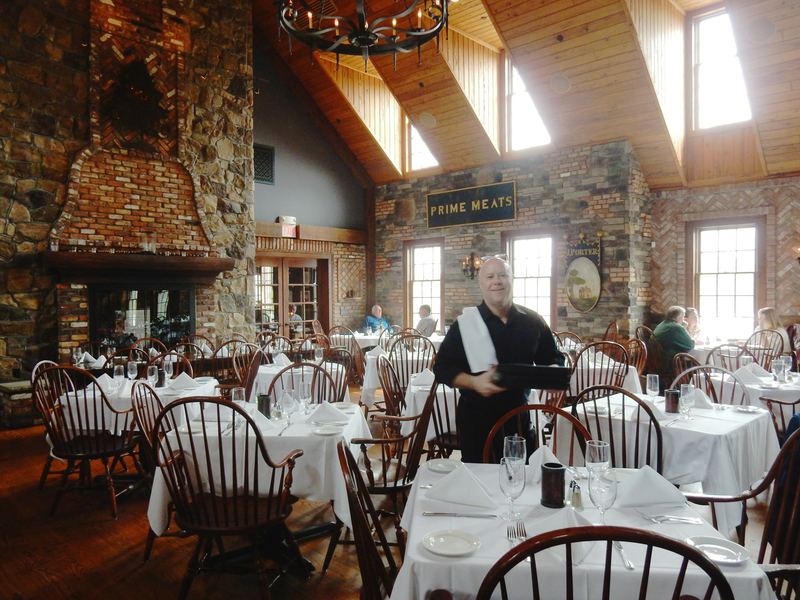 EAT: Locals also love St. Moritz and Il Porto in Sparta on Lake Mohawk. STAY/QUIET: Wooden Duck B&B. If you’re seeking a place that provides serenity and peace just an hour from New York City, you won’t find better than the 10-room Wooden Duck B&B. Jason and Maryann Jerome took over as innkeepers three years ago, painted walls with color and put their own stamp on this elegant, luxury out-in-the-country inn. 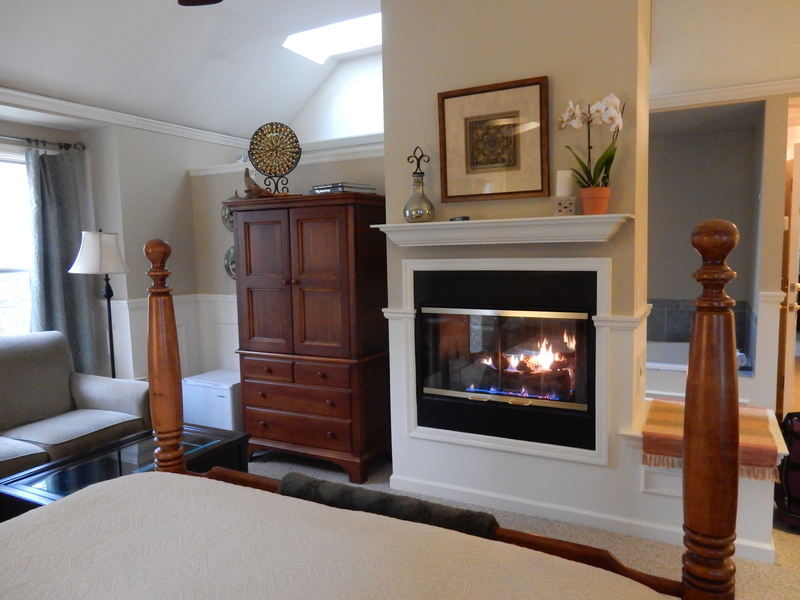 The Wooden Duck B&B is a Maven Favorite, with a full write up HERE. STAY/ACTIVE: There are two notable resorts in Sussex County NJ for the active traveler: Grand Cascades Lodge at Crystal Springs Resort for the discerning wine lover and golfer, Mountain Creek Resort for the winter sports and Water Park fanatic. Click on each for more information and photos. So sorry I was sick the day of your visit to the Sparta Historical Society but what a terrific job you did! We are all so grateful to you and hope you will come back again in the future. I am wondering if our paths actually did cross all those years I spent at the Bruce. I still go back to see old friends a couple of times a year. Thanks again and keep in touch! !